Here’s a super recharge offer for you – only until tomorrow! Now get Rs 20 cash back on every recharge or bill payment of Rs 50 or above. *You can use this promo code up to 3 times today. 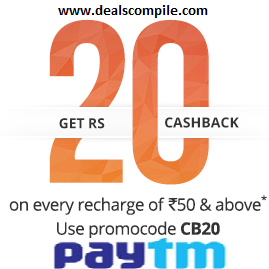 *You will get Rs.20 cashback on recharge of Rs.50 or more. So hurry, go to Paytm.com or use your Paytm App to recharge or pay your bill now!